Summary: Roof trusses are prefabricated wood structures used to support the roof. Trusses are incredibly strong. 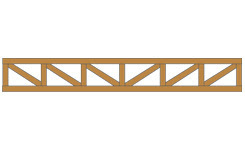 A roof truss calculator will help answer your roof truss questions. Carl, I have been looking for a small ranch plan on the Internet with a basement and 2x6 walls and stick built (rafter roof). I finally found one I like but has a truss roof. If I buy the plan, is this something that is easily changed to satisfy state codes etc., and if so, by whom? Trusses are used for a reason. Roof trusses are able to span large horizontal distances without vertical support in the middle. Roof trusses are prefabricated, triangulated wooden structures used to support the roof. The alternative is to build up the roof's frame with 2x8s and 2x10s. Trusses are required by all building codes to be engineered by a structural engineer and have an engineer’s stamp on the truss’s drawings. Everything needs to be carefully designed when designing a home, regardless of the size house you are planning. Most home plan providers provide plan modification at a nominal price. Since the roof is such a critical part of the structure, have it done before you buy the plans, otherwise, you will end up paying more to have the modification made locally. 1. They are generally a lot less expensive than on site framing. 2. You can have interesting features, like cathedral ceilings, at a low cost. 3. Since all the weight of the roof is transferred to the exterior walls, none of the interior stud walls are load bearing. This facilitates room design and allows for larger ceiling spans. It also facilitates remodeling, if necessary, later on. 4. 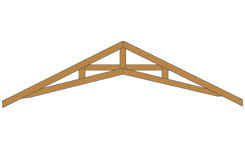 Any skilled carpenter can set roof trusses in a short period of time saving on framing labor. Here is a house using two different types of trusses on the same floor level, common trusses and scissors trusses. Using scissors trusses for the vaulted ceiling area and common trusses for the flat ceiling area. Today’s home designs call for large “open areas” that either require a truss system (roof and/or floor) OR, an engineered framing system that uses some or all of the following: steel beams, large wood beams, posts, heavier joists & rafters, or supporting walls. Posts and beams can be replaced with flat trusses.